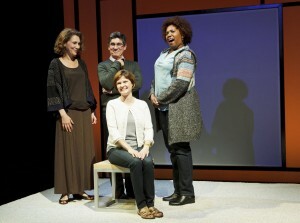 The cast: Randy Graff, James Lecesne, Mary Bacon (seated) and Saidah Arrika Ekulona in the New York premiere of the new play, Motherhood Out Loud, conceived by Susan R. Rose and Joan Stein presented by Primary Stages directed by Lisa Peterson. Now in performance through October 29th at 59E59 Theaters. Photo credit: James Leynse. It took me a while to get into Motherhood, both the off-Broadway play and the period after which one gives birth: Both had a slow start. But once I got into both the show and actual motherhood, they turned out pretty darn great. My friend Kim came along with me to see “Motherhood: Out Loud” in Manhattan on Friday night. Judging by the big grin on her face when I picked her up, it had been quite a while since she’d been out without the kids. She had that thrilled look on her face that said, “Tonight, I will not wipe anyone else’s nose!” Good thing I brought my own tissues. I’d been offered press passes to see the show, which promises to “reveal with illuminating insight the humor, raw emotions and rocky roads we experience in life.” After a stuttering start, the show delivers all that through a series of vignettes of the many faces of motherhood. More than chit-chat on the playground (though there’s that too), the play covers all sorts of facets of motherhood, including parenting a boy who prefers Disney princess dresses, dealing with a daughter’s first menstruation and facing the empty nest. There’s the hilarious: A gay dad who explains why “Where’s your Mommy?’ isn’t an appropriate question for Santa to ask. And the heart-wrenching: A mother who loses her son to the war in Afghanistan. The message is that no matter how diverse motherhood is, we can validate each other when we share how we feel out loud. The show plays in New York City through this weekend. After that, who knows? Maybe it’ll drop by your neighborhood for a playdate. If it does, bring a friend — and your own tissues. You’ll need them. MOTHERHOOD OUT LOUD – Testimonials and scenes form the show from Jeff Lilley on Vimeo.